All transactions are safe and secure with a reliable history in online purchasing behind each of our associates. 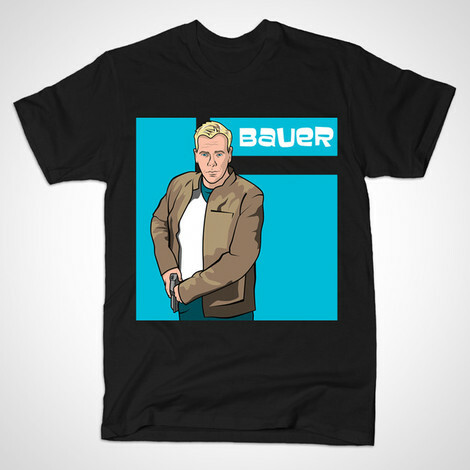 Buy the Jack Bauer Archer t-shirt to own 24 clothing and merchandise. This black Archer inspired Jack Bauer t-shirt is a great way to show your loyalty to your favorite CTU Agent. The design sits on the chest of the tee and features an Archer style cartoon logo. The Archer Jack Bauer t-shirt design is a great tee for fans of either Kiefer Sutherland's character or both TV shows. Wear it under a CTU 24 sweatshirt. Click through to browse the complete selection of Jack Bauer t-shirts and apparel. In addition to the Jack Bauer Archer tee above, browse the 24 Clothing Gallery for more apparel like men's and women's clothes, kids shirts or hoodies.